Your Number is 2187, Isn’t it? Your humble blogger is feeling a tad under the weather, so this week I thought I’d choose an easy sign to translate. While the recreation was a fairly simple task, this sign did lead to an aspect of Star Wars history to which I had not been aware prior to researching this post. 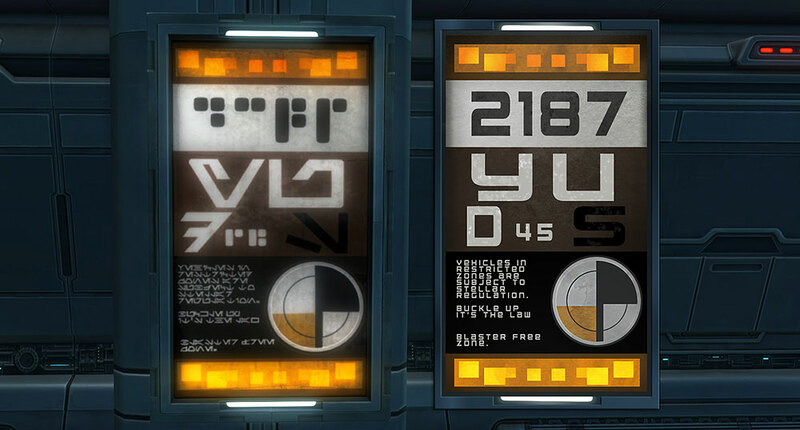 This sign is similar in style to many others found around Coruscant and other developed worlds of the Republic. 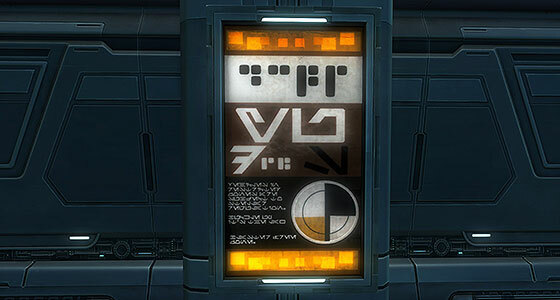 It contains the usual bits of random letters and numbers, a neat calibration icon, a warning about stellar regulations, and a gentle reminder to always secure your safety harness when traveling by speeder. While the large numbers atop the sign may seem random at first glance. They are far from it. Many fans will recognize them as the number of Princess Leia’s cell in Star Wars. And the numbers would come to even further attention as Finn’s stormtrooper designation in The Force Awakens. The number’s true origin lies in the name of a short film titled 21-87 by Arthur Lipsett. This film had a profound effect on George Lucas as a young filmmaker, influencing Lucas’ aesthetic style and his habit of titling his early movies with numbered sequences; perhaps most importantly the film provided Lucas with the initial inspiration for the concept of the Force, which would lead directly to our beloved Jedi heroes and Sith villains. The movie itself is quite abstract, occasionally disturbing, and definitely not everyone’s cup of tea, but it’s interesting to see something that had such a seminal influence on Star Wars. “In terms of understanding the power of sound and picture relationships there is no one better than Arthur Lipsett,” George Lucas said of the man who created 21-87. Comments Off on Your Number is 2187, Isn’t it?